Per his military service record (regimental no. 4861), Cyril Roy McMillan was born at Singleton, N.S.W. (This place of birth appears to have been recorded in error, as his birth was registered at Silverton, N.S.W., where his father was stationed as a Police Constable). He gave his age as 19 years and 2 months, his marital status as single, and his occupation as engineer. His description on his Certificate of Medical Examination was 5 feet 7 inches tall, weight 123 ½ lbs., with a fair complexion, blue eyes, and brown hair. His religious denomination was Church of England. He claimed to have 4 years military service in the Cadets and was still serving. He completed his medical examination at Parramatta on 10th November 1915. His initial Application to Enlist in the Australian Imperial Force form was dated 11th November 1915, and his father’s signature giving his consent is on this form. He was attested by Lieutenant R. Howe at Parramatta on 11th November 1915. After a successful recruiting meeting the evening before, the Coo-ees left Parramatta on the morning of 11th November 1915, with an official count of 27 new recruits from that town. 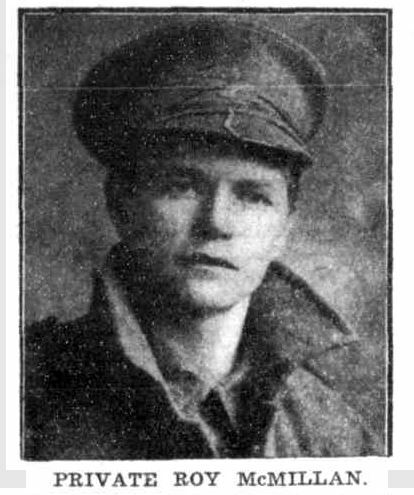 After completing the Coo-ee March Cyril Roy McMillan went into Liverpool Camp as reinforcement for the 13th Battalion. On 11th February 1916 Private McMillan was charged with being absent from fatigue duty. He was fined 5 Shillings. The Cumberland Argus and Fruitgrowers Advocate reported that Private ‘Roy McMillan’ was presented with a silver-mounted pipe, fountain pen, and other articles, at a send-off held for him and fellow Parramatta recruit Jack Saunders, at Parramatta on Monday 14th February 1916. (He was named as Roy McMillan in several articles in The Cumberland Argus and Fruitgrowers Advocate). On his embarkation roll Private McMillan’s address at time of enrolment was Marsden Street, Parramatta, N.S.W., and his next of kin is listed as his father, F. C. [Franklin Cutbush]. McMillan, at the same address. On 8th March 1916 Private McMillan, along with many of the other Coo-ees, departed Sydney on the HMAT A15 Star of England, as15th reinforcements for the 13th Battalion. He arrived in Egypt on 11th April 1916. On 19th April 1916 Private McMillan was transferred to the 45th Battalion in Egypt. On 2nd June 1916 Private McMillan left Alexandria aboard the transport Kinfauns Castle bound for France. He arrived at Marseilles on 8th June 1916. On 4th July 1916 the 45th Battalion was at Sailly-Sur-Lys preparing to move into the trenches for the first time, when Private McMillan was evacuated to the12th Australian Field Ambulance suffering from septic foot. On 7th July 1916 he was sent to the 4th Division Rest Station. He rejoined the 45th Battalion on the 12th of July 1916. On 20th June 1916 Private McMillan was charged with being absent from billet without leave. He was awarded 7 days confined to barracks. On 6th September 1916 the 45th Battalion was refitting at Beauval, France, when Private McMillan was evacuated to hospital. On 10th September 1916 he was admitted to the 2nd Canadian Stationary Hospital suffering myalgia. On 19th September 1916 he was discharged from hospital to the 1st Convalescent Depot. On 24th September 1916 he went to the 4th Australian Division Base Depot at Etaples, France. He rejoined the 45th Battalion on 17th October 1916. On 7th March 1917 the 45th Battalion was training at Bresle, France, when Private McMillan was evacuated to the 12th Australian Field Ambulance, then transferred to the 3rd Australian Field Ambulance with trench feet. On 8th March 1917 he was moved back to the 45th Casualty Clearing Station. On 11th March 1917 he was placed aboard the 9th Ambulance Train and admitted to the 3rd Stationary Hospital at Rouen, France. On 13th March 1917 he was placed aboard the Hospital Ship Warilda at Le Havre for transfer to England with trench feet. He was admitted to the Kitchener Military Hospital at Brighton, England, on 14th March 1916. A letter dated 23rd March 1917 that he sent home to his father was reported on in the The Cumberland Argus and Fruitgrowers Advocate: ‘Sergeant McMillan, of the Parramatta police force, has received a letter from his son, Private Cyril Roy McMillan … in which he stated that he had then been in hospital in England suffering with trench feet’, and that ‘In describing the complaint, he says that the toes swell up, then wither away, and fall off in bad cases’. On 27th April 1917 Private McMillan was discharged from hospital and granted leave to report to the No. 1 Command Depot at Perham Downs on 12th May 1917. On 20th July 1917 he was transferred to the No. 3 Command Depot at Hurdcott, England. On 23rd November 1917 he marched in to the No. 1 Command Depot at Sutton Veny. On 6th December 1917 he marched into the Overseas Training Brigade at Longbridge Deverill, England, near Sutton Veny. On 3rd January 1918 Private McMillan departed Southampton bound for France. He arrived at the 4th Australian Division Base Depot at Le Harve, France, on 4th January 1918. On 22nd January 1918 Private McMillan rejoined the 45th Battalion when it was resting at La Clytte, Belgium. On 5th and 6th April 1918 the 45th Battalion was in action around Dernacourt, France. On 13th April 1918 it was recorded in Private McMillan’s service record that he was reported Missing In Action on 5th April 1918. On 14th May 1918 he was reported to be a Prisoner of War in Germany. After being released at the end of hostilities, Private McMillan was repatriated to England on 10th December 1918, and admitted to the 4th London General Hospital, suffering Dysentery. On 18th December he was transferred to the 3rd Australian Auxiliary Hospital. On 23rd December 1918 Private McMillan was discharged from hospital, and granted leave to report to the No. 1 Command Depot at Sutton Veny, England, on 23rd January 1919. He was granted leave again from 7th June 1919 to 19th September 1919. During this period of leave he attended a Motor Training Institute in London. On 25th September 1919 Private McMillan departed Devonport, England, aboard the H.T. Port Denison, bound for Australia. He arrived in Australia on 17th November 1919, and was discharged Termination of Period of Enlistment on 9th January 1920. 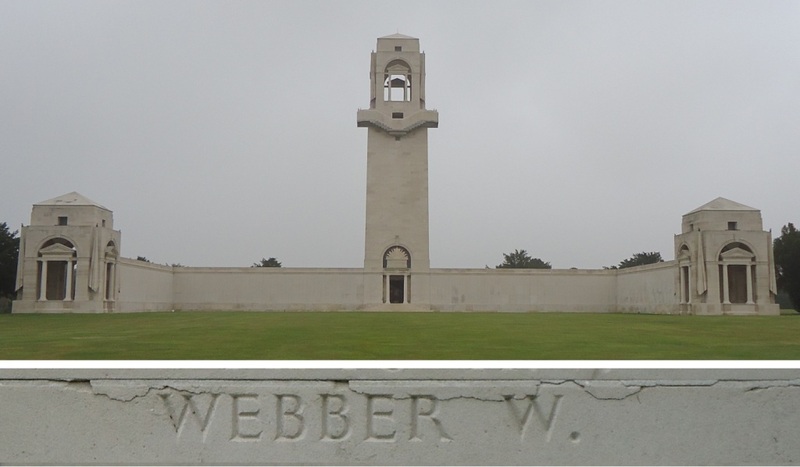 William WEBBER was one of the Coo-ees attested at Ashfield. He was killed in action on 6th April 1918.